Why am I writing so much about the seed of Abraham? After all, there are so many other issues that seem to be much more important when it comes to examining the Middle East crisis. Let me be bold enough to say that how a person understands the biblical teaching on the seed of Abraham, determines how much he will grasp the theological implications of the Middle East crisis. 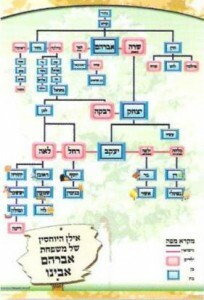 Does the seed of Abraham only relate to Jewish people? Does it include Arabs and Christians as well? Can one support the idea that those who call themselves the seed of Abraham are no longer the “true seed of Abraham” if they refuse to accept Jesus? These are essential questions any student of the Bible must come to grips with. Too many erroneous sermons have been preached in the church concerning the identity of Israel causing confusion among churchgoers. Unfortunately, this was one of the main issues espoused by Wheaton College NT professor Gary Burge in his recent lecture at the Christ at the Checkpoint Conference, “The Theology of the Land According to the New Testament.” However, in his lecture Burge hardly referred to the land of Israel but instead set his scope on casting a dubious hue on the identity of the Jewish people as the true seed of Abraham, and consequently no longer legitimate heirs of the Promised Land. If a person can demonstrate that Jewish people today are not the true seed of Abraham, this teaching goes hand in hand with the belief God no longer has a present covenant with the Jewish people in which He has promised the Jewish people the Holy Land of Eretz Israel. Burge, like many replacement theologians (the belief the Church has replaced Israel as God’s people), quotes a string of New Testament passages to support his view that DNA (aka Jewish ancestry) no longer matters, but faith is what matters most to God. Since Christians demonstrate true faith in the God of Israel by accepting the Jewish Messiah, then Christians must be the true seed of Abraham. The next leap in Burge’s theology is to state even though the Jewish people are entitled to a homeland, there are no biblical covenants today that entitle them to this land. Because of their failure to accept Christ, they have forfeited the divine land rights to Israel. What we are seeing today is a secular movement of the Jews returning to the land, but without the blessing of God or the fulfillment of biblical prophecy. One of the passages used throughout the history of Christian doctrine to prove Jewish people are not the true seed of Abraham is John 8. In fact, John 8 has been used by medieval theologians to teach that the Jewish people have been spawned by the devil. In John 8:44 Jesus tells the Jewish leaders He is speaking to that their father is the devil. 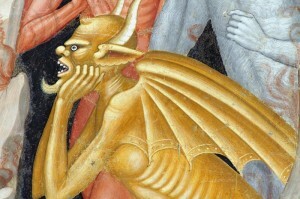 The devils display anti-Semitic stereotypes all too common in late medieval and early Renaissance art. While Burge has not gone so far as to connect Jewish origins with the devil, he does use this passage to teach the Jewish people who do not believe in Jesus have been replaced by Christians.